I’m sitting in my living room recliner watching CSI and thinking about how wonderful it will be to crawl into my bed in a few minutes. It was a long day getting here—I think I spent 25 of the last 28 hours in planes and airports. Yesterday, besides being endless, was really fun. By noon we were shopping in Casablanca’s Habous. I got some beautiful wood boxes and these great leather “pouffs.” They’re basically leather footstools that the buyer fills with whatever—foam peanuts, old clothes, plastic grocery bags. 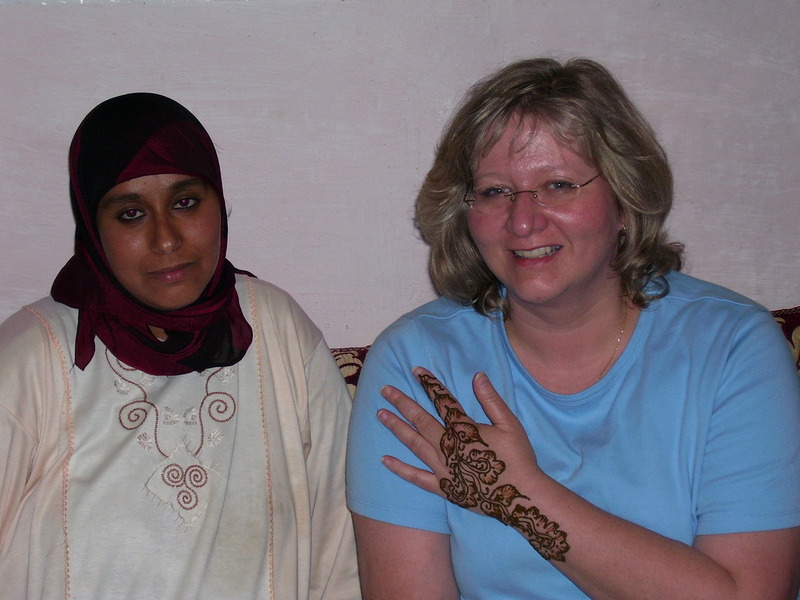 Then in the afternoon we went to a local woman’s house to visit and for her to do some henna designs on me. I thought I’d get a little something on my wrist and MAYBE something on my ankle. Well, both hands, both feet, 3 inches past my wrists, and 4/5 of the way up both my calves have designs. She did a beautiful job, but I’m feeling a little like I don’t blend so much here in America. Well, not in “my” America anyway. It will be interesting to see the reactions I get from the youth group kids at the Nuggets game tomorrow night! And if I really get my act together and figure out how to do it, I’ll post some pictures. Like I said, don’t hold your breath. Two nights at home are going to be heavenly!